2012 Odyssey World Junior Golf Championship - Meet Our Champions! Thank you to everyone for coming and making this our best event to date! Travel safe! Rankings! - Did you know this event is ranked by the Scratch Player World Amateur Rankings, the Royal and Ancient World Rankings, Golfweek Rankings, NJGS Rankings, and Callaway World Series Rankings? also AJGA PBE! The 2012 Odyssey World Junior Golf Championship was one of the most exciting events we have hosted to date. Almost all 10 divisions had close races to the finish but no division was more exciting than our Boys 15-18 Division finish. We brought this event to PGA West becuase of the history of the course for Professional Golf being played here and felt that our Junir Golfers needed to play on this big stage. It is a perfect venue for drama and Pete Dye challenges every part of your game. The weather this year was amazing with temperatures barely reaching 100 degrees each round. Players and caddies took carts and pace of play was amazing. Some players finished in under 4 hours inlcuding a final round by our lead group in under 3.5 hours. Future CHampions Golf and the PGA West and La Quinta resort staff are proud to host this event and look to make this event one of the largest and most sought after events in Junior Golf Worldwide. "It is a perfect venue for a major junior golf championship, says Chris Smeal, Founder of Future Champions Golf. The courses are filled with history and prove to be a tough challenge for all players. The La Quinta Resort is beautiful and features over 800 rooms and 40 pools making it perfect host hotel for a major event. Special thanks to Al Geiberger, Mr. 59 for attending bot the welcoming party and the awards cereomony! Welcome to the FCG WORLD CHAMPIONSHIP @ PGA WEST! The Western Home of Golf in America - The World is Invited! Join Us! 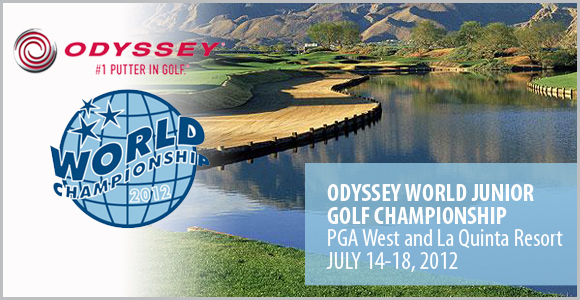 "THE ODYSSEY WORLD JUNIOR CHAMPIONSHIP"
This year the World Parent-Junior Championship will be on the PGA West Stadium Course so players and parents have a chance to play the signature "Alcatraz" Hole #17! Check it Out! The Future Champions Golf World Championship -"Building Junior Golf History"
We are excited to announce that PGA West and La Quinta Resort will continue to help us grow this event into the World's Best Junior Golf Championship. We now have access to more of the great courses at PGA West for 2012 which will allow us to host more players. PGA West Stadium, Nicklaus, Norman, La Quinta Mountain, and La Quinta Dunes. Parent Junior Championship will be held at PGA West Stadium Course on Saturday Juy 14, 2012. 2012 will be Bigger, Better, and Even More Exciting than 2011! Playing PGA West and La Quinta Mountain? Swimming in the 40 plus Pools? Golfsmith Pizza and Contest Night? Movies with Friends on the Huge Bean Bags?